'Run! ': After Warning Others, Heroic Emergency Workers Were Lost : The Two-Way Survivors in Rikuzen-Takada, Japan, say that after a tsunami destroyed their town, they never saw the civil defense workers who had stayed behind to warn others of the danger. 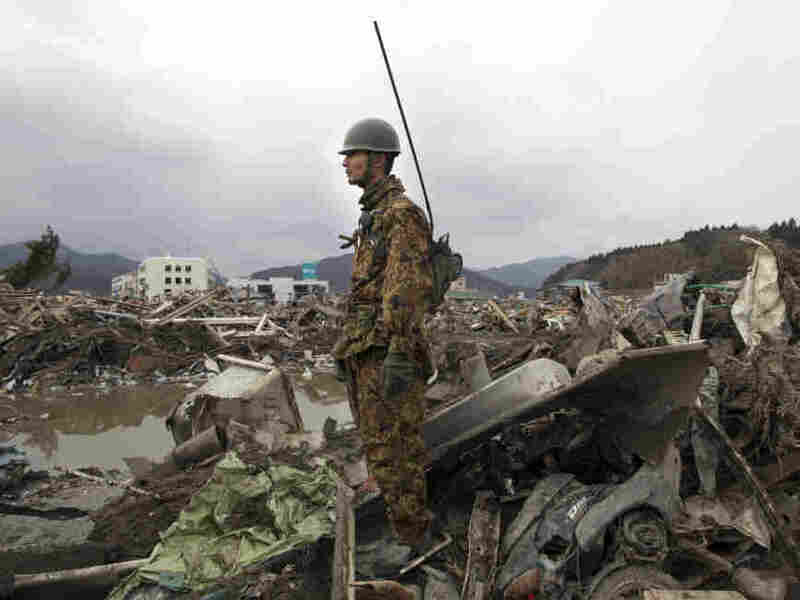 A Japanese soldier stood watch earlier today (March 15, 2011) over the rubble of what was Rikuzen-Takada City in Japan. There will be many, many stories of bravery as we learn more about what happened Friday in Japan when a 9.0-magnitude earthquake triggered devastating tsunamis that wiped some communities off the map, leaving thousands missing or dead. Chie Matsumoto, a journalist in Japan who has been traveling to some of the hard-hit areas and reporting on Twitter about what she's seen (you can translate her posts into English if you use Chrome as your browser), responded to a request for reports from Japan from our friends at the Public Insight Network with word of what people in Rikuzen-Takada City told her. A tsunami there tore through the community. "The announcement was cut off and the people never heard from the speakers, or the people who announced it, again. The few people assigned to announce it were at the disaster prevention center, and they went missing. "They sacrificed their lives to send everyone else to a safer place. They gave priority to others' safety. The disaster prevention center is now under the mud brought on by the tsunami." The Public Insight Network connects journalists from American Public Media and other partner newsrooms with people around the world who can help report on events. You can become a source here.